Ben Roberts, who picked up an injury against Widnes. Injuries are stacking up for Castleford Tigers ahead of the start of the 2015 Super League season, but head coach Daryl Powell believes he has a squad to cope. Lee Jewitt and Frankie Mariano have been unable to play in any of the pre-season matches and have already been ruled out for the start of the campaign. This week they have been joined on the sidelines by another forward, Matt Cook, who has damaged his hamstring. Another two back row men, Oliver Holmes and Junior Moors, have also picked up knocks along with half-back Ben Roberts and full-back Luke Dorn, although Powell is hopeful they can recover in time to play against Wakefield Wildcats on February 8. “It was not perfect to pick up injuries like we did last Sunday,” Powell told the Express. “Matt Cook injured his hamstring in the warm-up before the game and Oliver Holmes picked up a bit of a groin injury. Ben Roberts got a little bit of a calf injury as well and with the heavy conditions quite a few of the boys cramped up a little bit in the calves. “Matt Cook’s injury is a grade two tear and he will be out for three or four weeks so obviously looks like missing the Wakefield game. It’s disappointing for him because he has done well in pre-season. “Oliver Holmes is going to have a scan on his injury, but we’re hoping he’ll be okay and we’re hoping to be able to manage him through. “Ben Roberts should be okay for the start of the season as it’s just a tweak in his calf. We’ll see how he goes over the next week, but I’m hopeful he’ll be available. Luke Dorn as well after he’s had a pectoral muscle problem. “Lee Jewitt will definitely miss the start of the season because he needs another operation. It’s a blow for him. He had an operation on his hip and he needs a double hernia by the looks now so we’ve just got to get him through it. “Frankie Mariano is getting better. He had a really big operation on his wrist, which has been causing him trouble for a couple of years. He’s a few weeks away from full training, but he’s getting there. “It’s creating us a little bit of trouble that it’s the forwards who are mostly injured, but we’ve got a little bit of depth there and we’re going to have to utilise it right from the start. 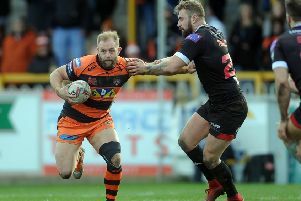 Powell has received some good news with new recruit Moors returning to training this week while Ryan Boyle has suffered no reaction after playing his first two games after a long term absence. Powell added: “Junior Moors was back in training on Tuesday and would have had a run on Friday against York. “Ryan Boyle is fine. He’s getting better all the time and just needs games under his belt.